Back in April this year Michael Hintlian from Boston won our Tom Wood prize draw after donating £5 towards the running costs of Oriel Colwyn. Many thanks to all who donated, your help and support is greatly appreciated. 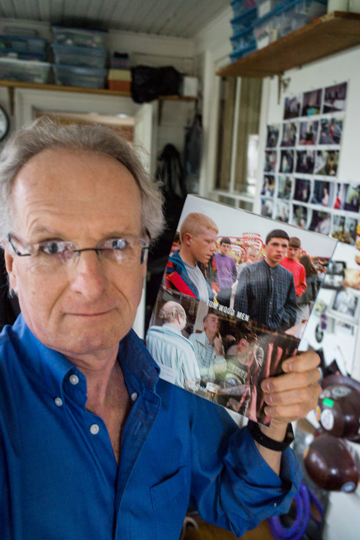 The signed books and print have now arrived in Boston (thanks for the wonderful 'selfie' Michael). As Michael is a photographer himself with some interesting projects under his belt, we thought it would an ideal opportunity to introduce you to him and his continuing work. Michael Hintlian, a full-time documentary photographer based in Boston. His work has appeared in major U.S. dailies and international periodicals, and has been widely exhibited and collected. His photo-documentary of the Central Artery/Tunnel Project in Boston (the Big Dig) was published in 2004; Digging: The Workers of Boston's Big Dig (Commonwealth Editions). He is currently at work on major projects in the United States and travels extensively. Hintlian has served on the faculties of The School of the Museum of Fine Arts, Boston, The New School for Social Research, and Parsons School of Design, New York. Currently he chairs the Department of Documentary Photography at New England School of Photography in Boston. Hintlian is a principal in VisualReportage Workshops a leading workshop for photographers with destinations in Central America and India, his students have gone onto win prestigious awards including participation in the Eddie Adams Workshop.